Fio Corporation today announced that it has received a grant financed by the Bill & Melinda Gates Foundation to adapt its Fionet™ solution to connect rapid diagnostics and data in the fight against Ebola. By integrating intelligent mobile devices for diagnosis, treatment, and data capture with cloud-based information services, Fionet will deliver complete, reliable data within minutes from frontline health workers to remote health managers and organizations responding to the Ebola outbreak. Only 18 laboratories in West Africa currently have the capacity to test suspected Ebola cases — four in Guinea, nine in Liberia, and five in Sierra Leone It can take days for blood samples to be transported to these centres from patients at triage, and for results to return. Further exacerbated by weak infrastructure, this can mean days in quarantine waiting to get results, increasing the chance of infecting, or being infected by, others. Several companies are working to bring to market rapid diagnostic tests that can reliably detect Ebola within minutes from a pinprick of blood or sample of saliva. Grant funding will make it possible for Fio’s Deki™ Reader to objectively analyze results from these tests and then immediately transmit results and case reports to the Fionet database. Patients will get results right away, so they can be instantly isolated, released, or tested for other causes of illness. All this frontline data, available to remote managers via secure online access, will help them make significant gains in containment. In real time, managers will be able to monitor the epidemic, identify hot spots, direct scarce resources and supplies to where they’re most needed, and track potentially infected contacts of patients. For every new case of Ebola, health workers must track down every person who was in contact with that patient during the preceding days and weeks. Those contacts must then be closely monitored for signs of illness. This is usually accomplished by recording data on paper forms, which are transported to data-entry centres and entered into an electronic database. Even one missed contact can keep the outbreak going. Grant funding will contribute to the enhancement of Fionet mobile software to supplant this cumbersome process with digital data collection. Health workers will be able to instantly feed contact tracing data to Fionet via smartphones and tablets, reducing time lag between data captured in the field and response. With real-time access to interactive network maps of contacts, managers will be able to quickly identify others who might be infected and begin to arrest transmission. Many West Africans suffering from diseases other than Ebola, but which also cause fever, are not being treated while awaiting Ebola test results. 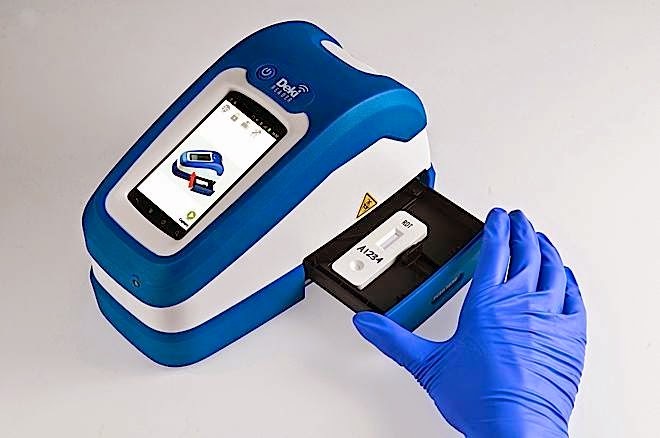 Fio’s Deki Reader, which will be configured to read Ebola tests, is already CE-marked for use with rapid diagnostic tests that detect malaria and dengue, two common causes of fever in West Africa. “After adapting Deki Readers and Fionet to combat Ebola, this same technology will leave the health systems in West Africa better prepared to manage future outbreaks, as well as existing endemic diseases,” said Ian Fine, Fio’s Chief Technology Officer.